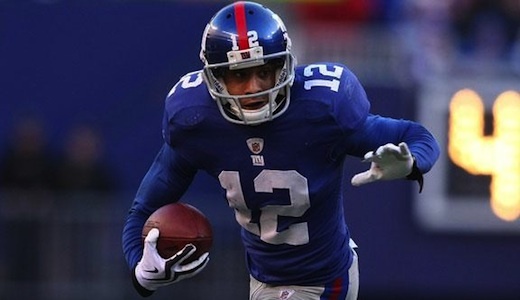 Heading into NFL free agency, the New York Giants had two big decisions to make at the wide receiver position. The first decision they had to make was whether or not to bring back veteran wideout Plaxico Burress who was recently released from prison and had missed the last two seasons as a result. Even though Burress had gotten a lot of buzz around the NFL in terms of teams interested in signing the veteran, the Giants weren’t sold on the fact that they should bring him back as he did cause some problems in New York before being sent to prison. Despite head coach Tom Coughlin meeting with Plaxico Burress to see where his head is at and reportedly offering him a new contract to come back to New York, the one-time Super Bowl champion decided to sign with the New York Jets. receiver Steve Smith. With Smith being the favorite target quarterback Eli Manning in the passing game, many people believed that there was no way they would let the star wideout go anywhere else. Unfortunately, despite the New York Giants being interested in re-signing Steve Smith, the team really didn’t have much of a chance to do so. The Philadelphia Eagles on the other hand were able to swoop in and add yet another Pro Bowler to their roster by signing Steve Smith to a one-year deal. This move to sign Smith was a surprise to say the least for the Eagles as it appeared that Andy Reid and company were content with their new roster. Apparently, that wasn’t the case as they were able to give superstar quarterback one more weapon in the passing game. It would be hard to argue at this point in time that the Philadelphia Eagles aren’t the big winners of the NFL free agency. The one move everyone anticipated the Eagles making was trading backup quarterback Kevin Kolb to a team in desperate need of a starting quarterback. Shortly after teams were allowed to trade players, the Arizona Cardinals acquired Kevin Kolb and sent corner Dominique Rodgers-Cromartie to the Philadelphia Eagles. This move alone was a giant step in the right direction as the Eagles had upgraded their defense, but they weren’t done there as they signed arguably the most sought after free agent available in superstar corner Nnamdi Asomugha formerly of the Oakland Raiders. As if that weren’t enough, the Eagles went out and made some considerable upgrades to their offense as well by signing quarterback Vince Young, running back Ronnie Brown and now adding wide receiver Steve Smith. Needless to say, the Philadelphia Eagles are ready to contend for a Super Bowl title this season and have arguably the most talented team in the NFL on both sides of the football. It will be interesting to see if these moves work out or end up blowing up in Andy Reid’s face.